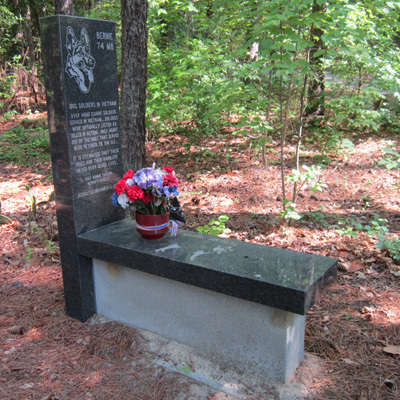 Source: Dog Soldiers in Vietnam Memorial, Durham. Photo courtesy of Donald Burgess Tilley, Jr. The memorial is an L-shaped bench made of polished dark granite resting atop a base of light granite. Although the marker is meant to honor all dog soldiers that served in Vietnam, this marker memorializes a specific dog named Bernie. Both the bench and back of the marker contain carved images of Bernie, a German Shepard. The back contains an inscription honoring dogs that served and were killed in Vietnam. Although dogs have been used by the U.S. military since World War I, the Vietnam War saw the most use of dogs in combat. A list created by NIH Veterinarian Dr. Howard Hayes confirms 3,747 dogs used in Vietnam, although estimates of the actual number of dogs used is around 4,900 between 1964 and 1975. No official records were kept until 1968. Of the thousands of dogs in Vietnam, only around 200 returned, and none returned to civilian life. As many as 10,000 handlers served in Vietnam with these dogs. The marker is located in Rock Quarry Park, directly south of the tennis courts and east of the Museum of Life and Science bike path. Rock Quarry Park is located off Murray Avenue. 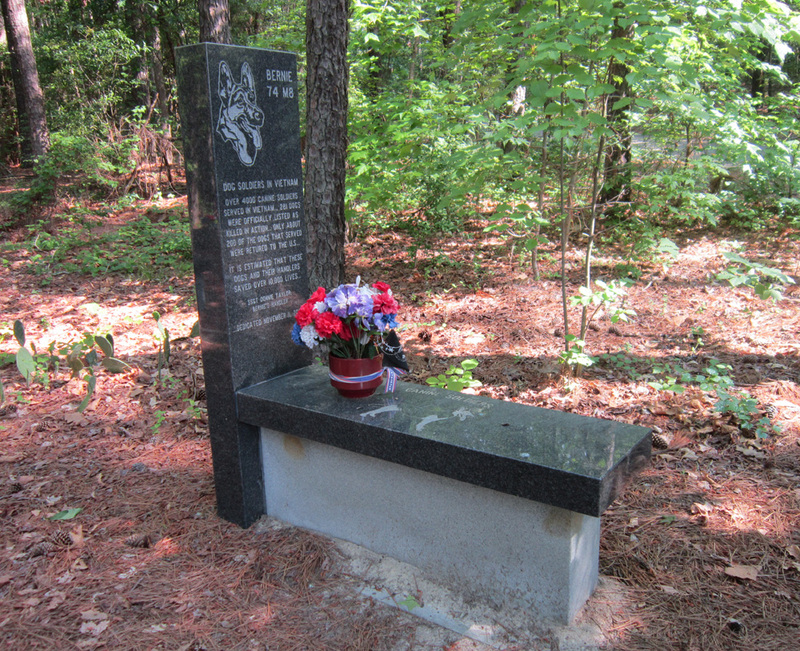 The marker appears in a wooded area of the park, surrounded by foliage and embedded in the ground.